Virtual Reality has really fast become an actual business with annual revenues of $13.6 bln, experts estimate. Its prospects, according to SuperData, are even more impressive, with the global market growing by more than 80% every year, to reach $37.7 bln by 2020. Developer teams across the world are trying to monetize virtual technology. New projects are launched in Russia every month, monitored closely by venture funds and major technology players. Successful investment will not only allow making a product that would be popular in the relatively small Russian market but also claiming global leadership. The entertainment segment comprises just under ten serious players. Stanislav Starykh says several venture funds have already been responsible for large investment into the segment. Arena Space VR parks received $7.7 mio from the Rucard processing company, the deal organized by IP Fund. Arena Space founder Vasily Ryzhonkov and his team have been developing a project for full immersion VR themed parks since 2015. Ryzhonkov is confident that the technology that creates a new immersive model of interaction between man, machines and the outside world has a promising future. During this period, technologies have become truly market-oriented. The first park was opened in September 2016. Today, Arena Space has 7 parks (three owned by the company and four franchises), including Eastern Europe’s largest VR park located in Central Children’s Store on Lubyanka in Moscow, and agreements on launching venues abroad. The company intends to conquer the global market by starting its business in Europe. Currently, the Arena Space team is negotiating with operators of shopping and entertaining centers in Great Britain and Spain. The Knight Frank real-estate transaction and consulting partner will assist the startup in entering Europe’s market. To develop its business in foreign market, Arena Space is opening headquarters in Amsterdam, while the development department will remain located in Russia. “The European traditional entertainment market has long been shared between companies. But despite European residents’ conservatism, they show a great interest for innovative projects including VR”, Ryzhonkov says. “We will develop a different format in Europe – open-air VR parks – as Europeans do not like spending much time in shopping malls. 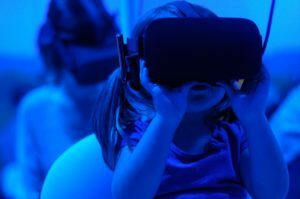 We plan to open the first three VR amusement parks during 2019”. According to Ryzhonkov, the company’s plans include launching 250 parks within the next five years. He believes the market will see breakthrough development as soon as the existing technologic barriers are eliminated. First, communication channel bandwidth should be expanded and signal delay cut (both VR and AR require the 5G standard, which will appear in Russia only in 2021). Second, accumulators should be developed that will charge power-consuming gadgets for a considerable amount of time, while wearable electronic devices should be made smarter and more light-weight. VR developers have generated demand for greater user interaction within virtual reality, so the role of feedback devices that can read human biometric indicators such as EEG, ECG and body position is increasing. They are almost useless alone though: the signals must be interpreted in real time, so neural networks are needed to interpret the data flow. One of the startups of the SIGMA.Novosibirsk group of companies (part of the FIEP Rusnano nanocenters chain), PlusMinus, is working on a wireless helmet project for use in VR games. The helmet will read the brain signals and a neural network will use them to suggest various options for further game plot development – even more extreme or, on the contrary, milder. The team is using new electronics technologies to create an inexpensive, lightweight and convenient device: flexible and dry electrodes, silicon-free electronics, energyharvesting and others. This way the helmet can be used not only for research purposes like most of its imported analogues: the Russian helmet is lighter and does not require the application of media gel on the head. PlusMinus received the order in the late spring of 2018 and plans to deliver a turnkey device in a year. According to SIGMA.Novosibirsk spokesperson Olga Orlova, the helmet prototype has already been made and the neural network training process is now underway. “The most difficult part of making the helmet is to teach the neural network to correctly recognize emotions; this feature needs to be developed from scratch: there is no database for such signals, because wearable devices that read EEGs are not yet common. The hardware development and industrial design take less time in the project timeframe than the training of the helmet,” Orlova says. An electronics developer’s job is to create design documentation: following it, the customer will manufacture the end products at any industrial facility. The end price of the helmet is estimated at $350. So far, SIGMA.Novosibirsk does not think much of the Russian market capacity and therefore plans to act ahead of the curve. “We estimate the current capacity of the Russian wireless neural helmet market at several thousand units, but in the coming years, with their price going down and with the development of more content, we expect an explosive growth in the market for compatible devices,” Orlova added. The team of Russia’s Sberbank CEO Herman Gref is showing an active interest in VR and AR technologies. This past summer, Sberbank launched its VR and AR laboratory. On December 20, the bank announced the opening of a virtual reality cinema chain, a joint project by the operator of the banking loyalty program Thank You From Sberbank and the VR graphics studio ImpulseMachine. Within the next few months, first six movie theaters will be opened, each having from 9 to 20 personal halls. Developers plan to show specially created content, with a spectator having an opportunity to influence the unfolding events, which will make it something between a thriller and a computer game where a viewer will be able to interact with characters by wearing a helmet and using controllers. According to general director of the Thank You From Sberbank program Andrei Pisarev, virtual reality and VR feature films, where viewers can influence events, will become the trend in the near future. The company expects that over 130,000 people will visit VR cinemas during the first year of their work. To achieve the goal of establishing the largest VR cinema chain, Sberbank expects to start cooperating with the MEGA chain of shopping centers. The first VR cinema, opened at the Mars center, can seat up 14 people. The ticket costs between RUR 650-1,650 ($9.8-$25), the cost depending on the quality of the headset used by a viewer. In the first film, Kessler Effect, three actors prevent a space station from being destroyed by a collision with space debris, where a viewer can act as a robot called Aurora. By engaging in the project, Sberbank expects to increase the loyalty of the Thank You From Sberbank bonus program users, which now includes over 36 million registered members. Large technology companies’ attention to VR and AR technologies shows a growing market potential of developments in these areas. Large investments may well stimulate the market. “The VR gaming market so far remains rather expensive due to the inability to re-use many developments”, believes Alexei Zinchenko, general director of ModumLab studio. “We think that the future of virtual reality lies not only in the amusement sector but also in introducing it in business projects. Many major companies are already successfully implementing these technologies for training its employees and presenting projects. Efforts are also being made to introduce VR technologies in the Russian educational sector”. Previous ArticleSmart phones are replacing cashNext ArticleWho is hung up on Bitcoin in Russia?